Following the moon has truly revolutionized my self-care routine. The waning moon is one of my favorite phases of the moon because it’s all about slowing down and connecting with yourself on a deeper level. 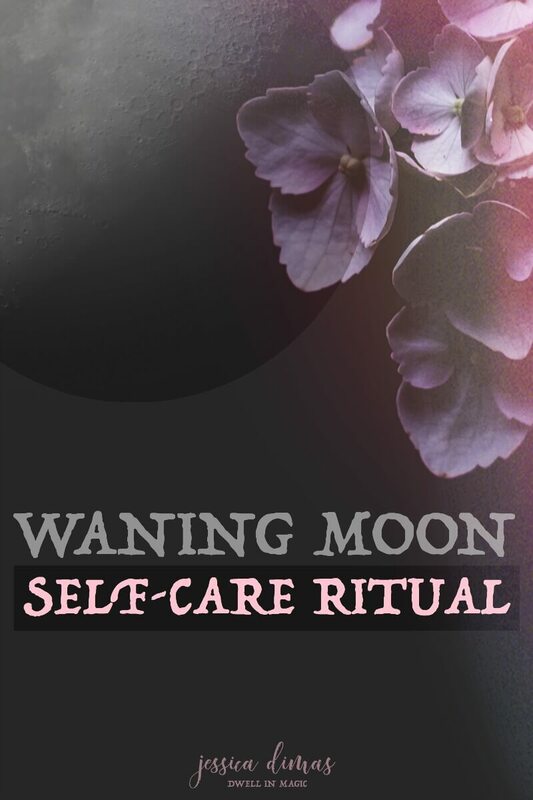 In this post, I’m sharing my waning moon self-care ritual and daily habits I like to practice during the waning moon period. Between the time of the Full Moon and New Moon, the moon gradually returns back to darkness, with the energy surrounding it becoming more still and reflective. Just as there is a time to plan, act, and celebrate, now is the time to rest, release, and make space. During the Waning Moon, we can begin to slow down, reflect on all we’ve learned in the last few weeks, keep what we want that came to us and let go of what’s holding us back. The Waning Moon is traditionally a good time to work on things you want to release: illness, negative people or situations, emotions you want to heal and release. It’s a time of taking care of yourself, acknowledging everything you’ve accomplished and worked on during this cycle. Just like soil needs time to replenish before planting new seeds, so do you. An overworked field doesn’t produce a quality harvest. If you constantly try to act, act, act…you’re going to burn out. The Waning Moon reminds us that it’s necessary to slow down, take stock, clear clutter, and make space for the new cycle. As an introvert (INFP in the house!) I really resonate with the energy of the Waning Moon as well as the New Moon. The slower paced energy and time of introspection is my bag, baby. Here’s my Waning Moon Self-Care ritual, which I hope gives you some ideas and inspiration for own. The Waning Moon is all about clearing to make space for the new. 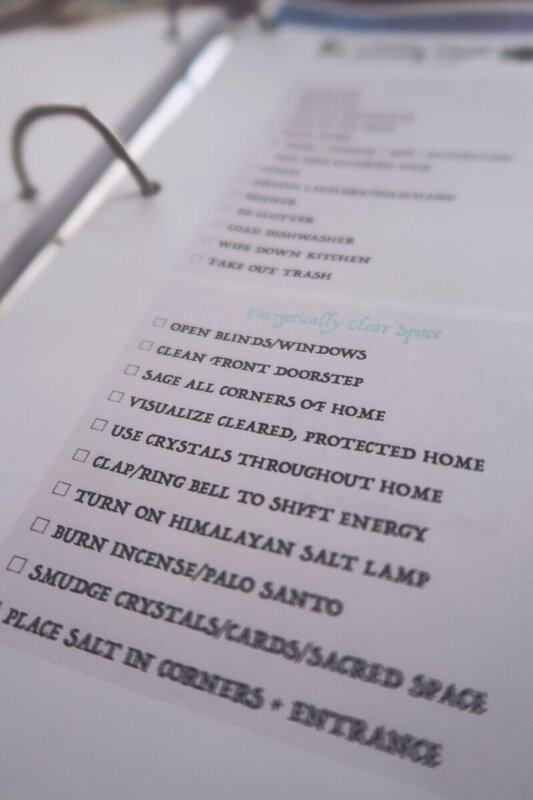 This is a great time to clear the clutter and cobwebs in your home so that energy is able to flow and bring clarity to your mind. If you haven’t decluttered in awhile, the first few cycles of doing this might be a bit of work, but it will so be worth it. You can instantly feel the difference when you walk into a decluttered space; it just feels lighter and inviting. I love using the cleaning schedule from the moon worksheets. It has a section for daily chores, deep cleaning, and energetically clearing your home. I like to go from room to room with two large trash bags, one for trash and one for donation. If I haven’t used an item in a year, it gets donated. All clothing that makes me feel uncomfortable when wearing it gets donated as well, even if it’s not an old piece of clothing. If you’re crafty I’m sure you find ways to recycle things in your home, but since I’m not it all just goes to our local donation center. 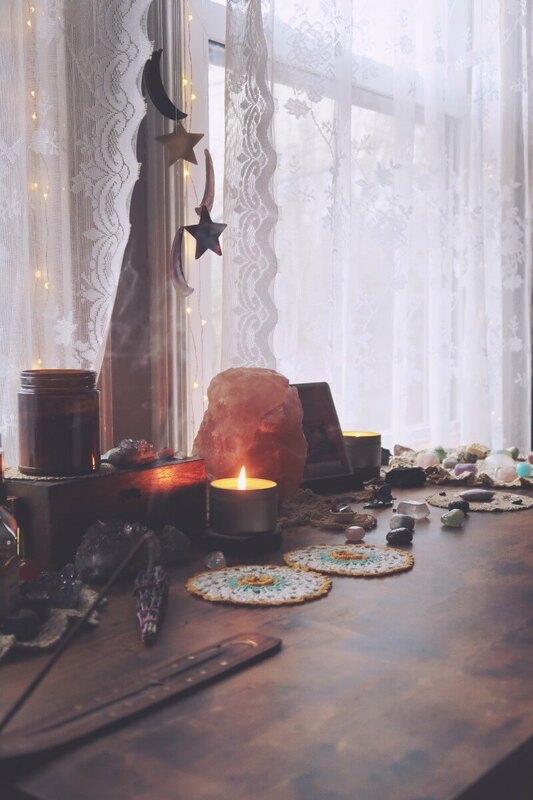 Once you’re done with your Waning Moon cleaning, go through your home with palo santo or some sage and energetically clear all the corners from stagnant negative energy that accumulated over the past lunar cycle. For any ritual I like to sit in my meditation space and first start by grounding myself. 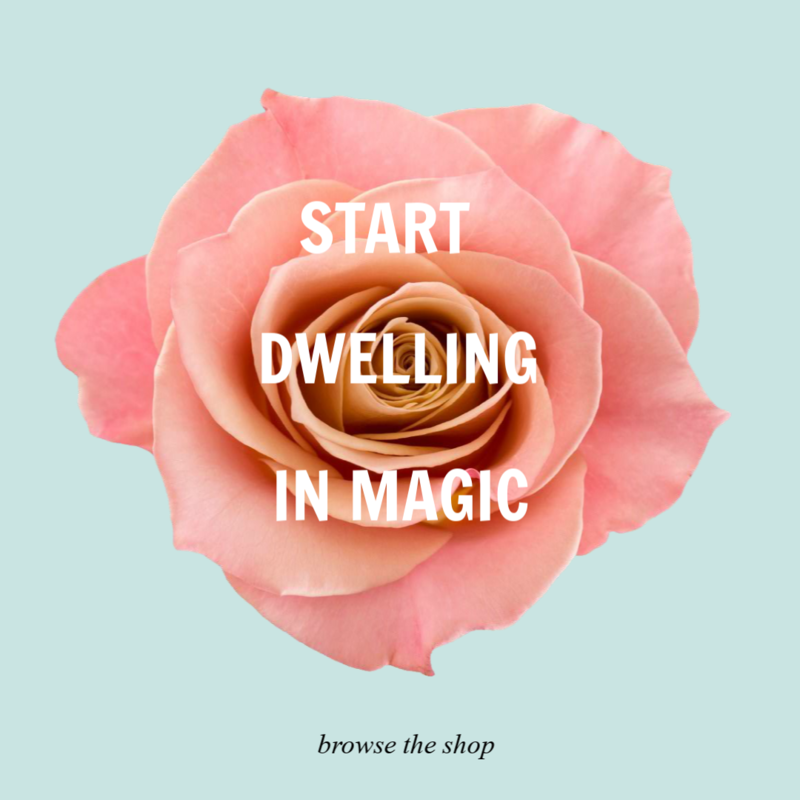 I do this by lighting incense and usually palo santo. I then take several deep breaths to help calm my body and become present. If you have any essential oil sprays or roll ons, use those to help ground yourself as well. I love Kate’s Magik Letting Go Anointing Oil which would be perfect for the Waning Moon and Full Moon as well. I rub the oil on my wrists, pulse points on my neck, and over my heart as well. Candles or some other soft lighting is always something I like to incorporate. If you have crystals, some good ones to bring forward would be Lapis Lazuli to help with reflection and clarity, Angelite to restore tranquility, or Lepidolite to eliminate stress and anxiety, as well as assist in making positive life changes. It’s helpful to first reflect on everything that was brought forth this moon cycle. Like bringing in a harvest from the field, you need to sort through it all and decide on what you’re keeping. Think about what you learned and what good things manifested. Your intention doesn’t have to completely manifest within a moon cycle, usually it happens in stages. Think about all you accomplished and what went well. Acknowledgement and appreciation of these things will aid in more manifestations as you go into the next moon cycle. Acknowledge yourself and the Universe for what was manifested this cycle! What came up for you this past cycle? What were your biggest blocks? Did anything random happen? Think about what has come up for you and take a moment to try to see if there are any messages contained within these experiences. Think about how this specific block is holding you back from your intention manifesting. Or what could you find within yourself that you could heal so that you stop attracting a certain kind of experience or block for yourself? Within each moon cycle, blocks will be brought to the surface to heal so that you can move closer to your intention. Never discredit yourself for blocks coming up; the Universe is bringing something to your attention…what is it? Contemplate on this past moon cycle and look for any messages you might’ve received. Any lessons learned. Any healing that needs to be done. Allow what you no longer want to hold onto to fade away with the Waning Moon. Think about your intention. You probably want it so bad and have a timeline set up in your mind on how everything will need to unfold for it to happen. But here’s what I want you to remember: the Universe can make it happen in any way it sees best. Your job isn’t to worry about how it will happen; your job is to visualize your intention in it’s end state, feeling with every beautiful fiber in your body how it will feel once it’s manifested, and let the Universe take care of the rest. You have to trust and let go. Surrender your worries and fears. Feel yourself falling into the arms of the Divine and just release your grip. Allow the Universe to guide you instead of trying to forge your way through. Nothing needs to be man-handled in order to manifest–the gift of feminine energy is that we allow and receive. Allow the Universe to surprise and delight you. Your job is to literally follow what feels good; feelings of excitement and ease are the breadcrumbs the Universe is leaving on the perfect trail to lead you where you want to go. Don’t worry. You accomplished more than you think you did in this past moon cycle. One of these moon cycles your intention will manifest before you even realize it and when that happens, remember to acknowledge the blessing and all of the lessons that came with it. As the moon grows darker each night, turn more inwards yourself. Rest and reflect back on this past cycle. Is there anything you’d like to do differently? Is there anything you’d like to have ready to aid you in the next cycle? Lay low this week, making space emotionally and physically for the next lunar cycle, allowing yourself and your mind to rest. The clearer your space and mind, the more ready you’ll be when the New Moon arrives. 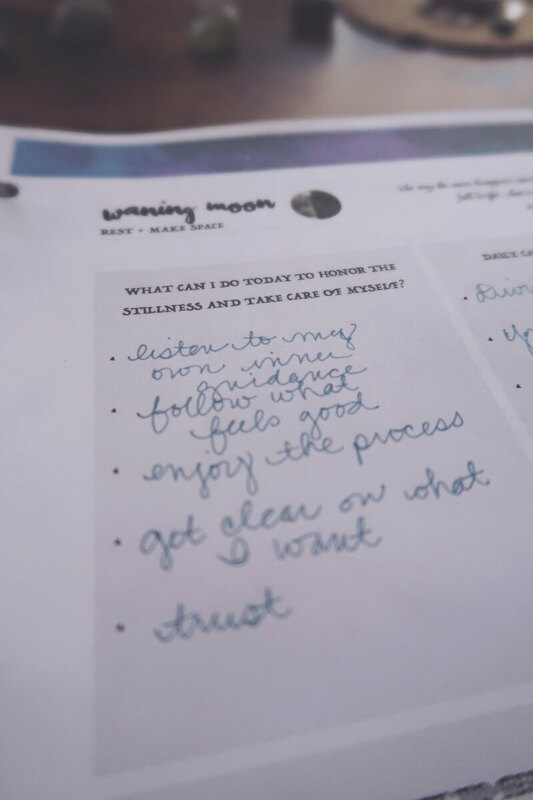 Every morning during the waning moon period, I fill out the Waning Moon morning worksheet. It helps to remind me to slow down and take care of myself. I hope you enjoyed this post; if you have a Waning Moon self-care ritual, I’d love to hear about it in the comments below. If you’d like to see snippets of my moon self-care rituals and daily self-care, follow me over on Instagram. I frequently share parts of my self-care in my Insta stories. I am so new to this and I want to get everything from it that I can. I have a lot to learn but reading this makes me realize I’ve had a few signs and pushing thoughts as to what I need to create and manage. This is really FABOULUS I Love it Thank you~~ From a Grateful ENFJ!! 🙂 Blessings ! Yes They are very compatible ! Blessings !! 🙂 Thank you again ! Hi Jessica, I loved your recent waning moon self care ritual!! Reviewing ~ Letting go ~ so you can move forward, with a de-clutter ~ Home ~ Mind ~ Spirit ~ Body. I loved it so much I posted it on my spiritual face book page.